A team led by an Italian physics professor has developed an indoor "skylight" that mimics sunlight, blue sky, or cloudy sky more faithfully than has been achieved before. Paolo Di Trapani, a professor and physicist at the University of Insubria in Como, Italy, worked on an EU-funded research project called CoeLux through 2011 and 2012. The result is embodied in the startup CoeLux Srl, which will be commercializing the sunlight-simulating technology. The CoeLux lighting system consists of white LEDs that reproduce the sunlight spectrum; a polymer optical system designed to produce "a sensation of distance between the sky and the sun"; and titanium dioxide nanoparticles that, in just a few millimeters, mimic the Rayleigh scattering process that occurs in the Earth's atmosphere. Different compositions of the nanoparticles produce the effects of direct sunlight, blue sky, cloudy sky, twilight, etc. In a version of the technology that mimics the sun in a blue sky, two different sizes of nanoparticles are clustered in different sections of the plastic; they separate white light into blue-dominant wavelengths and a bright spot of sunlike yellowish light. The images that appear on the CoeLux website, one of which is reproduced above, look like computer-generated renderings, but we are assured they are un-retouched photographs. A prototype CoeLux skylight, 1.8 m long and 85 cm wide, was shown at Light + Building in Frankfurt, Germany, earlier this month. It took one of the slots in Lux Review's list of 10 hottest products at the show. 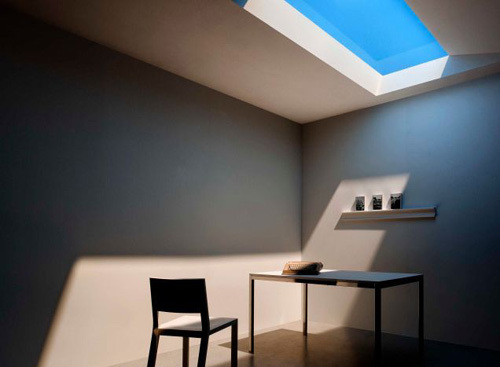 CoeLux Srl will be selling three models of the skylight, dubbed 60, 45, and 30. The names seem to represent the angle of the light produced; they also correspond to tropical, Mediterranean, and Nordic light, respectively. The applications for such light seem to be wide open: underground spaces such as mass transit; rooms in permanently smoggy cities; restaurant patios; shady apartments; research stations in Arctic or Antarctic regions; help for sufferers of Seasonal Affective Disorder. None of the descriptions I found talked about the photometrics, spectrum, illumination levels, or anything else quantitative. I'm sure the researchers and the commercial entity have these details, but they are talking now in much more expansive (and fuzzy) terms about the possibilities for CoeLux. I can't say that I blame them; the technology does look like something quite new. But I will be glad when samples get into the hands of those who can report in detail on their characteristics for the rest of us.